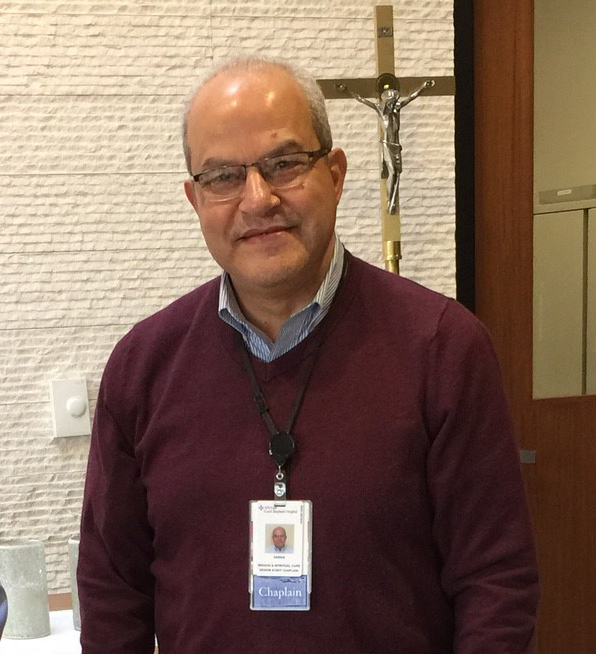 From groundbreaking work in the Christian ministry in the Middle East to war zones in Iraq to his mission as senior staff chaplain at Advocate Good Shepherd Hospital in Barrington, Rev. Karam Azab has made the health of the human soul his priority. “Health care organizations have a responsibility to be instrumental in society’s well-being,” he said. Thus he believes in the importance of public health and education. It is these factors that drive him not only in his role at Good Shepherd but in his work as Illinois state representative for the Association of Professional Chaplains and as a volunteer pastor of the Community Presbyterian Church of Broadview. Karam was ordained in the Presbyterian Church’s Nile Synod of Egypt in 1981. There he served many leading congregations before moving to Iraq, where he ascended to Spiritual Leader of the Protestant Churches from 1994 to 1997. In that time, he launched several ministries and ordained the first Iraqi national minister in more than 35 years. He also implemented several theological training programs to fortify the church in Iraq. In 1997 he arrived in the United States as pastor of an Arabic-speaking church in the Chicago area, where he learned about Clinical Pastoral Education. This intrigued him enough that he underwent CPE training, completed in 2000. From there he dove into the work, serving as a hospice chaplain at Seasons Hospice and Palliative Care, which now serves in more than 25 states of the US. Then, feeling a calling to support American troops in Iraq, he volunteered to serve as a linguist and cultural adviser in the war zones. At the same time, he also ministered informally to U.S. troops and others serving our country. After that stint in harm’s way, he returned to the United States to continue his work as a chaplain, becoming a lead chaplain at Northwest Community Hospital. He served there eight years to provide pastoral care to patients, families and hospital staff. In a way, he continues to support American troops: His two sons, Steve and Carl, are pilots and captains in the United States Air Force. His daughter, Carrie, inherited her father’s dedication to education. She is an assistant principal with a passion for serving children with special needs. He also has a grandson and another on the way. As a member of the Chicago Presbytery of the Presbyterian Church (U.S.A.), his professional life now includes co-chairing the Ethics Committee at Good Shepherd with Dr. Thomas M. Leskovac. Work in ethics is the perfect marriage of health care and ministry. After all, it’s all about the health of that human soul.